We have read so many books about Thanksgiving this year, that Abishai has pumpkin pie on the brain. He keeps asking if we can make one, and since I actually had the time today, I brought our sugar-pumpkin in from outside the front door to get ready for steaming. Abishai got busy picking out the seeds to use for our snack time. Olive oil & sea salt roasted pumpkin seeds––oh so good! The boys parked themselves at the table and just ate and ate. 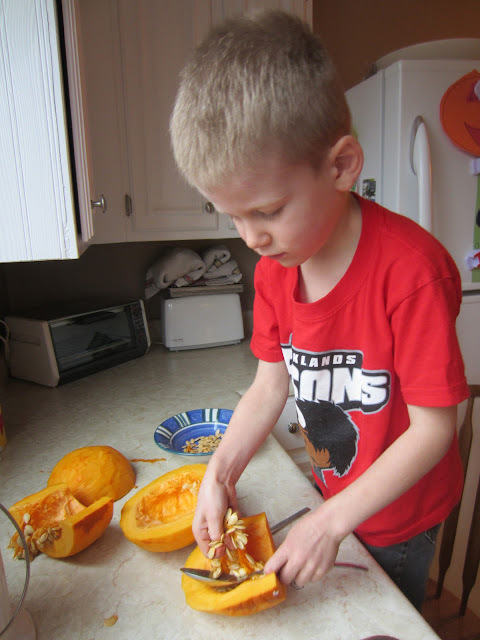 After making pumpkin puree, I set to work on making a spelt pie crust and a healthy pumpkin filling that wouldn't make me cringe every time the boys took a bite. It would be safe to say that with the recipe we used, they could have eaten an entire pie each without me having to worry about sugar overload. Snack time = pumpkin seeds!